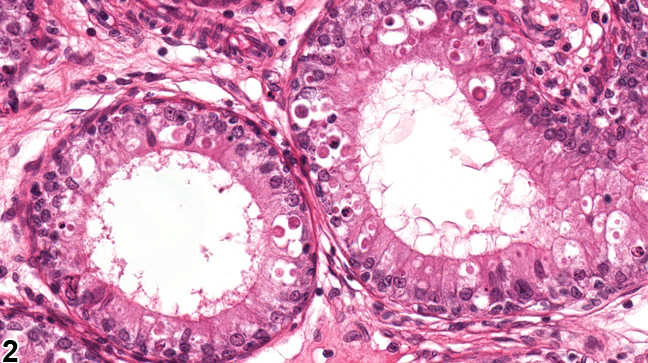 Apoptosis (or single cell death) of the epididymal epithelium is most commonly seen as a response to decreased testosterone levels. Normally, there is a low background level of apoptotic cells in the epididymis, but if testosterone levels decrease significantly, the number of apoptotic cells increases, first in the initial segment ( Figure 1 ) and then proceeding distally in a wave-like manner over time through to the cauda. Administration of estrogenic compounds have also been shown to produce this change through interference with testosterone. 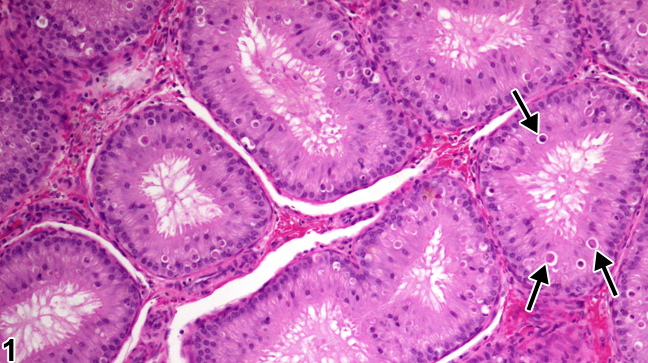 Increased levels of apoptotic epithelial cells should be recorded and graded should be and discussed in the pathology narrative if the incidence and/or severity appears to be related to chemical administration. When present in both epididymides, the diagnosis should be clarified as bilateral and the severity score based on the more severely affected epididymis. Correlation with disturbances in other male reproductive organs is recommended to aid interpretation. Ezer N, Robaire B. 2002. Androgenic regulation of the structure and functions of the epididymis. In: The Epididymis: From Molecules to Clinical (Robaire B, Hinton BT, eds). New York, Kluwer/Plenum, 297-316. Fan X, Robaire B. 1998. 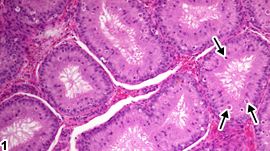 Orchidectomy induces a wave of apoptotic cell death in the epididymis. Endocrinology 139(4):2128-2136. Robaire B, Fan X. 1998. Regulation of apoptotic cell death in the rat epididymis. J Reprod Fertil Suppl 53:211-214.